× six = forty two Required Please enter the correct value. The world's central bank leaders continue to spike the monetary punch bowl, with investors imbibing on gold once again. This flurry of gold buying prompts many curious investors and doubting media to ask me two questions: 1) How can demand for gold and gold stocks continue; and 2) How high can gold prices go? To answer these questions, we need to look at the intentions behind the economic and political decision-making across several developed countries, analyze the causes, the effects, and the possible ramifications. For example, one of the most debated topics today is America's ongoing unemployment situation. Job loss has affected the lives and pocketbooks of millions of Americans and our friends and families, culminating to a center-stage position in the election this year. All eyes turn to President Barack Obama and Mitt Romney to explain how each intends to create jobs. During the two years following the Great Recession, Americans lost jobs at a similar rate to the employment losses during the Great Depression and in Finland after 1991. But two years after the crisis, U.S. employment losses stopped and reversed direction. Compare this to the situations in Norway, Spain, Finland and Sweden, each of which had prolonged unemployment. After Norway's financial crisis in 1987, it took 8.5 years to return to the country's employment peak. It took 13 years for Spain's employment to return to its 1997 peak. For Finland and Sweden, it took more than 17 years following their 1991 peaks. Although the job losses in the U.S. don't seem as dismal, "Helicopter" Ben Bernanke wants to avoid Europe's and Japan's catastrophic situations. To him, the economy "has not been growing fast enough recently to make significant progress in bringing down unemployment." In a speech to the Economic Club of Indiana on October 1, Bernanke explained that the Fed is "charged with promoting a healthy economy," which includes "an economy with low unemployment, low and stable inflation, and a financial system that meets the economy's needs for credit and other services." With regards to the decisions relating to monetary policy, the Fed's goals are dictated by Congress and are to seek "maximum employment and price stability." He explains, "We would like to see as many Americans as possible who want jobs to have jobs and that we aim to keep the rate of increase in consumer prices low and stable." Ten years earlier, Ben hinted at the way he might accomplish such goals as a Fed chairman. In a speech regarding deflation, he shared his position on a government's means to print money, referring to Milton Friedman's comment about dropping money out of a helicopter into the economy. He stated, "The U.S. government has a technology, called a printing press (or today, its electronic equivalent), that allows it to produce as many U.S. dollars as it wishes at no cost." Since then, he's been known as "Helicopter Ben." With unemployment continuing, the Fed's helicopter drops another $40 billion per month to buy mortgage-backed securities, as well as an additional $45 billion of longer-term securities per month through the end of the year. And, as Bank of America-Merrill Lynch says, "monetary policy is contagious." The Fed's money printing practice to help create jobs is only one part of the picture. Along with the growing U.S. monetary base, global liquidity has been growing every year for the past 12 years. As you can see, both of these factors have a close correlation to the rise of gold prices. While well-intentioned, I believe these "quantitative infinity" programs may have a devastating devaluing effect on currencies, which has helped to spur gold prices over this entire time period. Gold investors have recognized this correlation by returning to gold en masse. In August, investors rushed into gold, with the massive inflows of money going into the gold exchange traded products in August more than each of the prior five months. Buying continued in September, with gold lovers loading up on coins. According to Bloomberg, people purchased the most American Eagles from the U.S. Mint in eight months. Almost 70,000 ounces were sold last month-the most sold since January when the U.S. Mint sold 127,000 ounces. Miners also attracted interest, with the FTSE Gold Mines Index experiencing a rise of 13.25 percent and the NYSE Arca Gold Miners Index rising 12 percent during the month of September alone. See how U.S. Global gold funds performed. 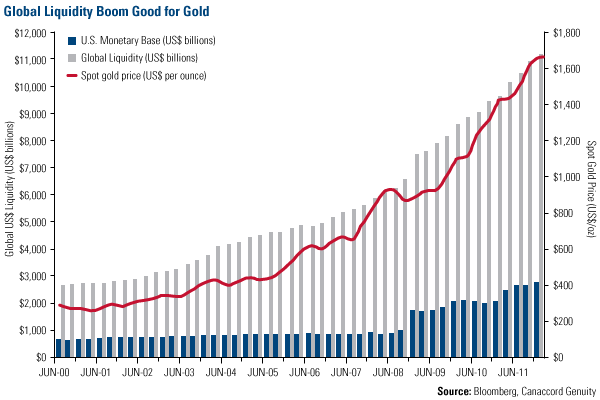 So how high can gold prices go? 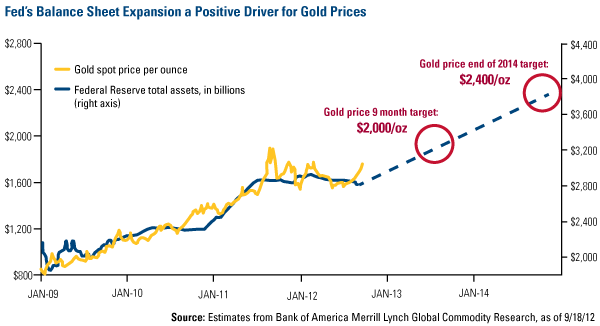 If you factor in only the Fed's program to purchase mortgages and Treasuries, Bank of America-Merrill Lynch says that over the next nine months gold could go to $2,000, and by the end of 2014, gold could be at $2,400. This target doesn't take the Love Trade into consideration. Over the past several months, we've heard only chirping crickets from India, the country that has historically been the world's largest consumer of gold. Demand suffered under a very weak rupee, as the price of gold in the local currency climbed to an all-time high. The rupee's recent strength has helped to increase Indian gold demand with flows climbing to a five-month high, according to UBS. What's helped bring shoppers back to the market is the fact that the exchange rate is back to where the rupee was in April. This improvement in the currency comes just in time, as the wedding season is in full bloom. Every year, about 10,000 weddings are held in India from late September through January, in between the monsoons and the summer heat. Gold has historically been closely linked with the celebration of weddings, as the bride wears the precious metal and gifts of gold coins are given to the newlyweds. In addition, Diwali will be celebrated in November. The Festival of Lights is India's biggest and most important holiday of the year and is celebrated by almost 1 billion Hindus around the world. Traditionally, on the first day of Diwali, it is considered auspicious to clean the home and shop for gold. Why is India so significant to gold? 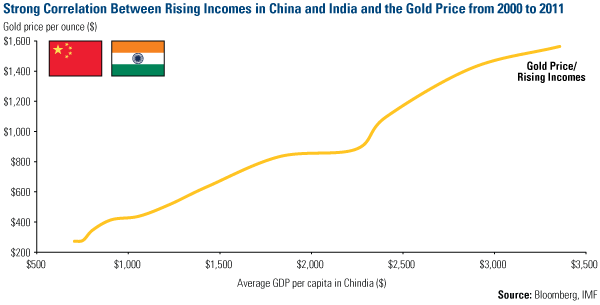 As you can see below, from 2000 through 2011, the rising incomes in both China and India have been strongly correlated to the price of gold. Investors now have two strong reasons to invest in gold: the Fear Trade, driven by an expanding monetary base, and the Love Trade, driven by rising gold demand in Chindia. If you're already sold on gold, make sure to maintain a modest 5 to 10 percent weighting in gold and gold stocks. For those investors who don't hold gold, what's stopping you? [Editor's Note: Frank Holmes is CEO and chief investment officer of U.S. Global Investors Inc., which manages a diversified family of mutual funds and hedge funds specializing in natural resources, emerging markets and infrastructure. He has been profiled by Fortune, Barron's, The Financial Times and other publications. That's one heck of an article. Here's my question. Does the Eurozone crisis have any effect on the gold price?